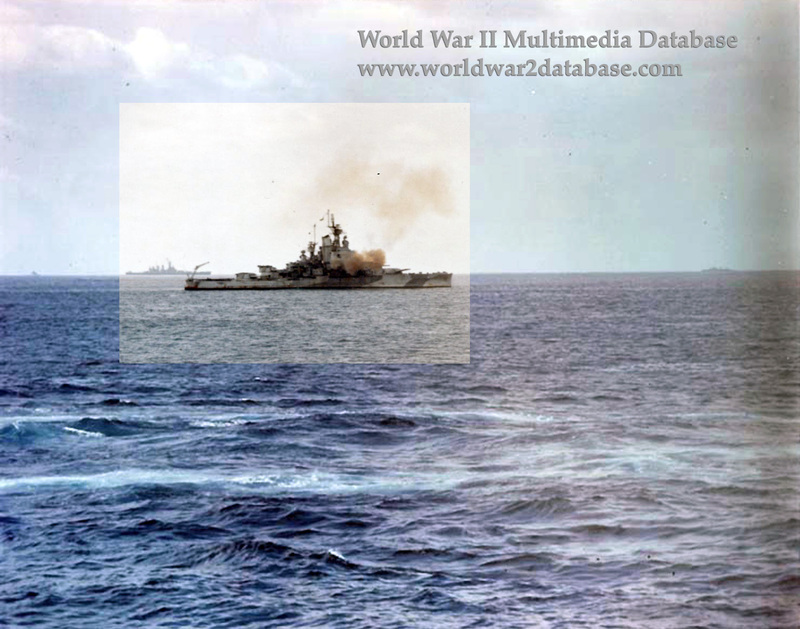 USS Nevada (BB-36) bombards Iwo Jima with USS Washington (BB-56) behind her. The old battleship Nevada, raised from the mud of Pearl Harbor, lead the Iwo Jima bombardment force close ashore. By the morning of 17 February the weather had cleared and remained excellent throughout the day. At 0840 Hours the Nevada, USS Idaho (BB-42), and USS Tennessee (BB-43) moved in to 3,000 yards from shore to provide close support for the underwater demolition team (UDT) operations scheduled to begin at 1100. While UDT's awaited orders to head for the beach, the covering fire support vessels experienced stiff opposition from enemy shore batteries. At 0840 Tennessee was hit and about an hour later the cruiser USS Pensacola (CA-24) rocked under the impact of several direct hits and near misses from heavy-caliber enemy shells. Pensacola suffered extensive damage and 115 casualties. Among the seventeen men killed was the ship's executive officer. The Japanese opposition did not go unchallenged by large-caliber naval weapons. Nevada leveled her 14-inch rifles on these shore batteries and continued heavy, concentrated counterbattery fire until 1240. On D-Day, February 19, Nevada, Tennessee and Arkansas covered the landing beaches and Mount Suribachi.